It’s good to know I’m not the only one who gets a bit stressed when trying to name a video game character. I guess it’s a little weird as I’ve always enjoyed making up character names, but at least there I have some idea as to who they’re going to be. You don’t really know what a kid is going to be like before you name them either, but that’s not an experience I’ve had. 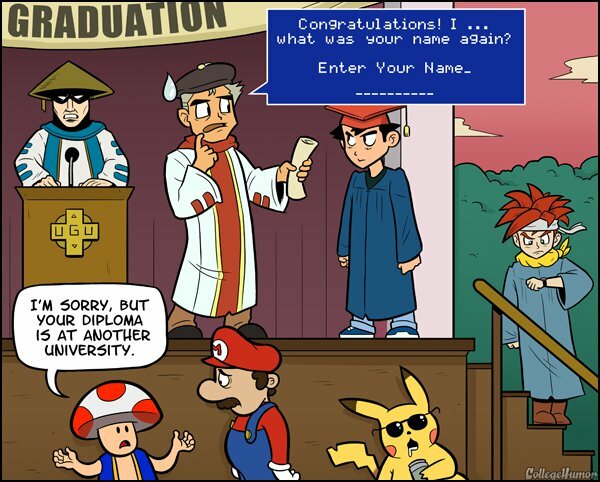 I usually stick with the default names when they’re there. I mean, I’m controlling this character, but it still isn’t really my character; I want something that fits into the game world. Sometimes there isn’t a default name, though, or there is one that it doesn’t tell you. Most of the Dragon Quest heroes were given names in media outside the games themselves, or when they guest star in games where they aren’t player-controlled. 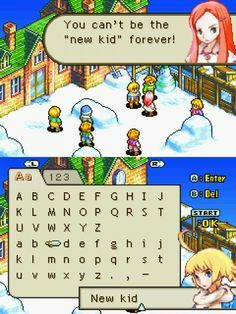 Apparently somebody had a preference for names starting with A: Alef in I, Aren or Allen in II, Arel in III (this character is the Erdrick/Loto mentioned in the first two games, but that’s explained to be a title), Abel in V, and Arus in VII. In IV, a male hero is Solo and a female Sofia; and the hero of VIII is officially named…Eight, spelled phonetically with the English pronunciation. Secret of Mana doesn’t have default names in the game, but the Japanese instruction manual calls the three playable characters Randi, Primm, and Popoi. There are also games that give the characters default names but let you change them later, although I never do. 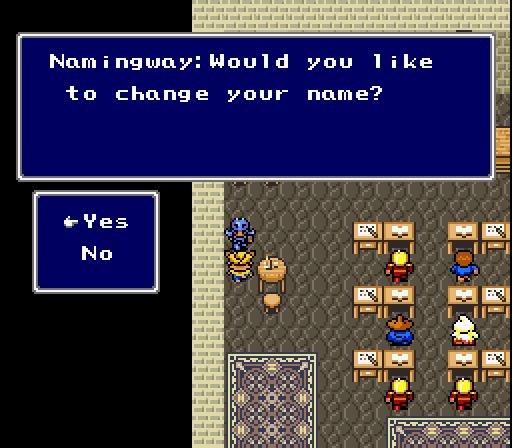 In Final Fantasy IV, there’s a character called Namingway who can change characters’ names. He’s a rabbit-like creature in a turban who’s from the Moon. I haven’t played the DS remake, but I understand that you can’t change the characters’ names because of the voice acting, so Namingway goes on a journey of his own. I thought it was kind of amusing how you can choose the hero’s name in Ocarina of Time and the text calls you by your chosen name, but Navi still calls him Link in her spoken parts. But then, we all know the hero in the Zelda games is named Link, so I’m not sure why you even have the option of calling him something else. Maybe it’s a nickname, or Link is his last name. I remember the end credits for Final Fantasy VI giving the name you used and then the character’s official full name. I’ll often take the lame route of just using my own name, although that sometimes takes me out of the fantasy. Then again, my name is common enough that it doesn’t seem that strange in a video game world. It’s actually the name of the protagonist in the Uncharted series, although I only know that from a commercial. When I first played The Sims, Beth pretty much made me create a Sim of myself, but since then I’ve mostly made Sim versions of characters I like from other media or ones I just made up myself. I’m not sure it makes sense, at least within my own mind, for me to be living in the same neighborhood with these people. Or would that make the me-Sim an avatar of their god? Anyway, in other games, I’ll sometimes use pets’ names, or those of characters from something I’ve read recently. 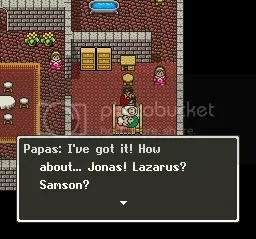 I mentioned the coincidence with the name I chose for my DQIX heroine, which probably doesn’t amuse anyone except me. And I think one of the female Townies in an expansion for the original Sims had my sister’s name, which is weird as it’s not very common. So those are some possibilities for character names, although you could always go with toilet humor, because that won’t get old fast. In Captain SNES, Alex names a lot of characters after himself and his babysitter Hope, so those become the most common names in Videoland. He also gives insulting names to characters he doesn’t like. 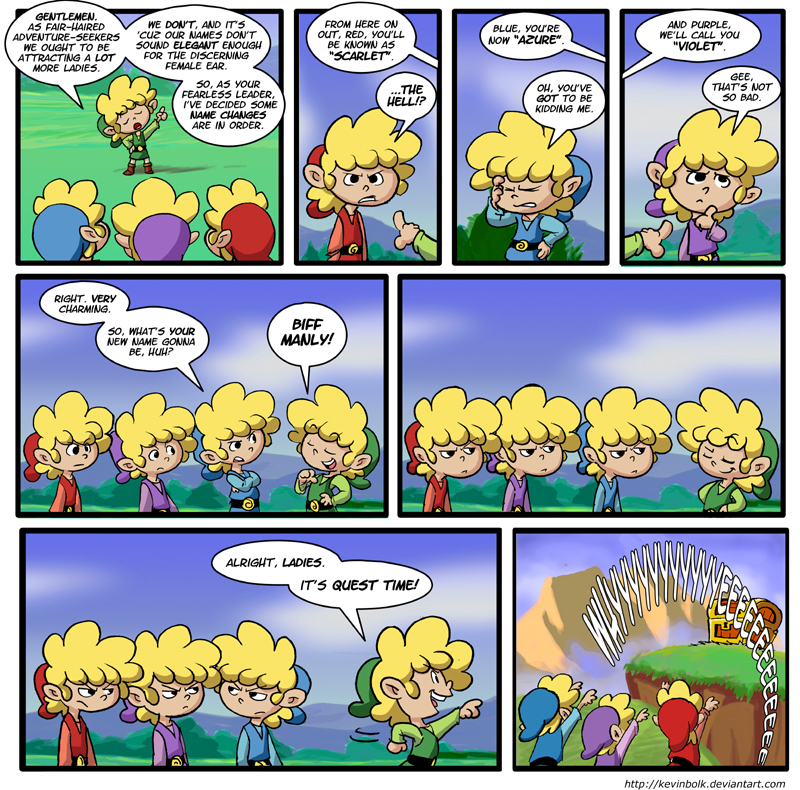 This entry was posted in Comics, Dragon Quest, Final Fantasy, Mana/Seiken Densetsu, Names, Sims, Video Games, Zelda and tagged captain snes, erdrick, final fantasy iv, loto, na'vi, namingway, ocarina of time, popoi, primm, randi, secret of mana. Bookmark the permalink. 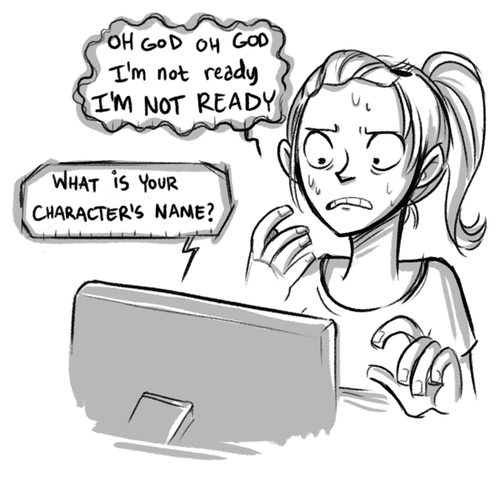 I don’t play video games, but I definitely do get stressed out trying to come up with user names for myself or names for characters I’ve made up. During a failed attempt to collaborate on a story, I think I probably drove my collaborator a little nuts by frequently changing my mind about what one of the main characters should be called. It probably goes all the way back when my family first got AOL. My original email address ended up being something stupidly nonsensical because I felt pressured to think of something on the spur of the moment.